Submitted by pb46 on Wed, 02/06/2008 - 3:56pm. This new file for the Montreal Metro stations has been expanded to include coordinates for access points as well as the actual stations (from 68 to 454). This can be productive for several types of transportation by directing a traveller to a closest access point instead of only a central location. Since subways use everything from tunnels to public buildings with multiple accesses, travelling to only a central location can cause unproductive travel. 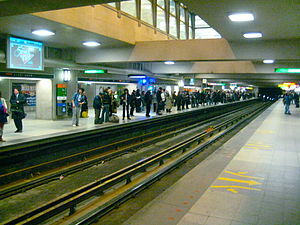 Locations and geocoding were downloaded from the local transit authority in Montreal (STM). Please note, that when the name of a station appears with no street info, coordinates refer to the station proper. When the station name includes street/intersection names, coordinates refer to a station access point based on a bus route. Buses to a Metro station always stop next to an access door. For this reason, it is possible that a few coordinates are virtually identical while some access points for the same station can be blocks away. However, for the purposes of navigating, including all coordinates does not cause a problem. Access to any station entry point, in the shortest distance, is the priority.